New York, N.Y. — A vast, never-before-seen archive of Marilyn Monroe’s own writing—diaries, poems, and letters—has been recovered and it reveals the star’s pain of psychotherapy; the betrayal by her third husband, Arthur Miller; her distrust of Peter Lawford; and more. 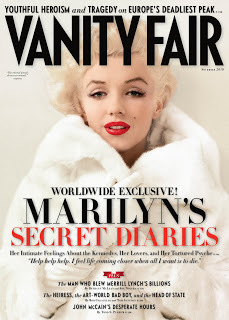 Vanity Fair contributing editor Sam Kashner, who has previously reported on Monroe for the magazine, analyzes the contents, and reports that the star was quite candid about her fragile mental state, and about her feelings toward those around her. Monroe recorded her anguish in a poem when she learned—from his own diary entry—that her then husband Arthur Miller was not happy with her. When they were living in Parkside House, outside Surrey, England, Monroe stumbled upon a diary entry of Miller’s in which he complained that he was “disappointed” in her and sometimes embarrassed by her in front of his friends. The actress was so devastated that she found it difficult to work, and had trouble sleeping. The November issue of Vanity Fair will be available on newsstands in New York and Los Angeles on Thursday, October 7, and nationally and on the iPad on Tuesday, October 12. I want to know why any of this is anyone’s business. Plenty of people deal with these things every day and it's unknown. As a whole i think the nature of this country based solely on consumerism is disgusting. I utterly detest those at Vanity Fair who felt it was their duty to publish someone’s personal thoughts. People drool over the self-destructive tendencies of celebrities and observe their turmoil as entertainment. This is not right. Where is the celebration of her personality? There is no place in the world for disrespect of this level. It is unbelievable that she will be immortalized with these things. All that remains of a person after death is the physical documentation of their life. With the media giving her life a full autopsy and displaying the contents across the table, they are not only soiling the future of her memory but insulting her greatly. If anyone agrees please say so. @Anonymous. Thanks for your comments. I must say that while I do feel these writings are very personal, in my opinion they do show Marilyn in a very positive light. In some aspects, Marilyn is celebrated in these writings. It's proven now that she was very "in touch" with herself as a person and as a woman. Unsure of herself, yes, but obviously deep and intellectual. These writings show that Marilyn was much smarter than nearly everyone realized. I agree that the writings are probably too personal for public view. However, they have been published. What we can learn from them is a bit more about who Marilyn was as a person. Was it always pretty and wonderful? No, but, we've seen a side of her not yet witnessed, and I personally feel that she now has a level of validation as a woman, a person and an artist that had never been encountered before. Also, as a point of note, Vanity Fair merely reported on the book "Fragments." If you are upset about the publication, which you obviously are, direct your anger toward the Strasbergs, for they are responsible for releasing these writings, not Vanity Fair. All of this is true. And as I agree that I was feeling somewhat frustrated by what I saw, to hear your (Scott’s) perspective was great. Let me raise this point though. I have only immersed myself in the culture surrounding Marilyn Monroe recently and although I have let myself feel a very personal connection with her work, I have had to stop and think… is it my right to know who she really was? As interesting as those presented facts are, I was not an acquaintance of hers nor would I ever be because she passed on many years before my own birth. It just strikes me as odd that a magazine could place a headline on their cover regarding an individual’s suicidal thoughts as if it were an average thing. The comment I left was not solely spat out to bash Vanity Fair but looking back…well yeah I could see that. Embarrassingly in my haste I didn’t get my point across tremendously well, but I believe advertising with someone’s confessions is just indecent. I imagine if it had been someone like me who had discovered those writings would this have been released? If it were up to me, absolutely not. I believe Marilyn Monroe, along with any celebrity or any person for that matter should be granted permission to exist on two levels; a personal level and a public level. As interesting or enlightening as her life may have been under the surface, she was an icon on the surface, and one of the most popular figures our country has ever seen. If we have had the privilege and the honor granted by her to sympathize and discuss her thoughts on life then in a way I think we’ve betrayed her trust. The fact is we do not have her permission. All those notes, and short poems and specs of thought that added a great value to the pages they were written on have been dispensed and reproduced for a profit. That is information on a personal level that should exist for a select few and that includes people she was close with or anyone she felt comfortable to share such things with. I have not read the article yet, or the book. The headline of the article set me off and I question myself every day when I look at the cover of the magazine lying on my desk and my eyes are scratching at the pages trying to open them. I too am interested, and would love to engage in the writings but I feel as though I’d be doing her a disservice. That is an unorthodox idea, I’m aware, but I simply feel ill knowing that information like that can be traded so enthusiastically. @W.G. : Very well put. I too feel that some things are just too personal to publish. I agree that these writings were made public merely for sensationalism, and for profit. However, I have to admit that there is a little part of me that is glad the writings were published, primarily for the reasons listed in my comments above. There are multiple ways to look at it I guess. I feel as though if I had read the article my take on this would be altered. I was shocked by the title and thus had doubts about reading it. My comments were forward and a bit misinformed, you could say, but again, they were in response to the title and captions alone. I intend to do more research on the publication itself. I am a big fan of hers and obviously not a supporter of the media. Thank you for your input, it's greatly appreciated. Always had a crush for Marilyn Monroe, but I'm finding now that I just might fall in love with her. Mostly for her beauty and also because of her dark side, I am a lot like she was and her loneliness only increases her beauty. Looking forward to learning more. She and I could have been old souls together! I feel and understand her every hurt! She and I both never knew our fathers! We both have misinformation on our birth certificate and both felt something missing in life, we were both made ward of the court, both had birth mothers in the mental institution with paranoid schizophrenia! We both had siblings taken away first who later we met! We both had different names at birth. Hers was norma jean. My name was Mona Lisa which ironically was also a nickname of hers! We both were childlike, shy, dreamy and naive who felt we had to be someone we were not for an image! We both loved children because we related better with them. We both were soft spoken and lacked in confidence or self esteem! We both loved acting and we were both told in childhood we would be movie star! My mom named me Mona Lisa so I would be famous like the painting, she told me! We both married men in the military for our first husband! We both have also been hospitalized, into psychiatric books, Multiple Sprituality and writing! We both have problems with suicide. We both needed sleep meds to go to sleep because of insomnia, both have fears of abandonmemt and being alone and are perfectionistic with some obsesive compulsive disorder! I am just beginning to know her, but I feel her thoughts and fears/feelings within my own soul! I fear fame for one reason, the cost of my own soul! As much as I love the feel of self expression with each character I bring to life, where would my own soul go? Would it die as hers did within the vastness of a unknown beauty, hidden by a smile! RIP Marilyn & Jean…the world was not yet ready for such a complexity as you, we are very much the same, you and I and your pain, though tucked away within the comfort of a pen and pad, reveal to all-the day dreamy girl with shy modesty, freckles and a fun hearted woman who begged for love just being her….RIP sweet soul!! !